Registration begins November 11 in Fellowship Hall or through the church’s website. What if you didn’t have to face car payments or credit card debt? What if you were on the same page with your finances as your spouse and could avoid those destructive money fights? What would the people of this church be able to accomplish without being held back by finances? For more than 20 years, more than 4.5 million people have learned how to handle money God’s way and take control of their futures. You have that opportunity! 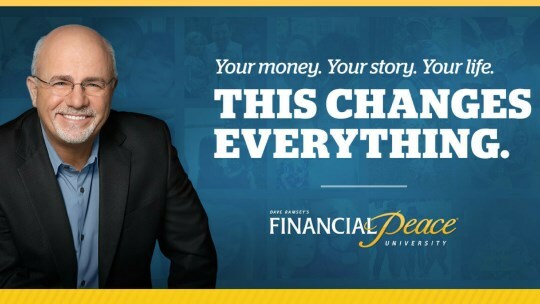 Financial Peace University by Dave Ramsey at EUMC began January 20, 2019. This weekly hour and a half class will instruct you over 9 lessons how to create a budget you can actually follow. There is a cost to the class and there are partial scholarships available, but it is strongly recommended each household finds a way to pay for the class. It will be your first wise financial step. One kit will cover one household/couple. Registration begins November 11th in Fellowship Hall or on EUMC’s website, here. Click here to register online (by December 22, 2018). *Nursery & Children’s One Room Sunday School will be extended for parents taking the course. May 1: Dave Ramsey's "Financial Peace University"
May 8: Dave Ramsey's "Financial Peace University"
May 15: Dave Ramsey's "Financial Peace University"
May 22: Dave Ramsey's "Financial Peace University"
May 29: Dave Ramsey's "Financial Peace University"